Random postings on politics, economics, history and anything else that is not technology (for that, see my other blog). My postings on non-technology subjects will be necessarily coloured by my background in technology, so apologies for that. But then, that's the unique perspective it gives me :-). Those reading the news from India would have heard of the "Not In My Name" protests, which were recently held across more than 10 Indian cities. 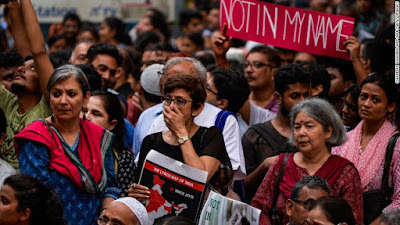 This movement was the idea of liberal Indians to protest the increasing attacks on their Muslim compatriots. 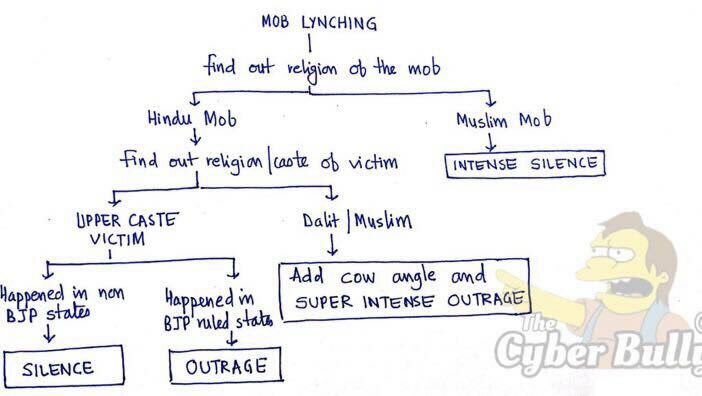 Since then, I've come across outrage from many educated Indians against the "Not In My Name" protests. This chart circulating on social media got my attention. I found this quite remarkable, and it made me think about some parallels. How many people believe that US cops are biased against black people? (Indians shouldn't be sanguine. Indian grandfather Sureshbhai Patel was assaulted and left partially paralysed by a white policeman, Eric Parker, and Parker was later cleared of all charges.) There have been many such cases. White people who commit crimes are led away in handcuffs to face trial, while black people in far less extreme circumstances are often shot dead on suspicion, and the cops get away scot-free. Some of the victims have been just children, but their families get no justice. Anyway, those who believed that blacks were being unfairly targeted started the movement called "Black Lives Matter." Shortly thereafter, another group of people, mostly white, started a counter-movement called "All Lives Matter." They may have honestly believed that they were correcting an imbalance, but to the rest of the world, including to many in India, they just came across as entitled, privilege-blind people. After all, what the original protesters were trying to say was that "Black Lives Matter Too", not that "Only Black Lives Matter". Now a similar situation is playing out in India, and the irony is that many of the same people who could clearly see that the US system is biased against blacks have now taken on the role of the whites when it comes to their own country. The injustice is startling. Take the earliest example. 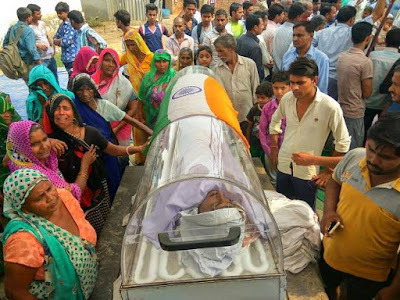 A man (and it is significant to add that he was Muslim) called Akhlaq Khan was lynched by a (Hindu) mob on the mere suspicion that his family had beef in their fridge. Today, it's still not clear whether or not they had beef in their fridge. But that shouldn't even matter! Even in states where eating beef is illegal, the law does not prescribe the death penalty, and definitely not through mob justice! His lynching is clearly a crime. Yet it's the victim's family that was slapped with an FIR. His assailants got away. Not only that, when one of those attackers later died of unrelated causes, a union minister attended his funeral, and his body was draped in the national tricolour as if he had performed a great sacrifice in the service of his country. To an external observer, this would seem to indicate that India had taken leave of its senses. Not only that, even when the case gathered international headlines, the prime minister, who tweets about every inconsequential thing, remained silent for days. When he finally spoke on the issue, it was to utter a platitude: Hindus and Muslims must fight poverty instead of fighting each other. 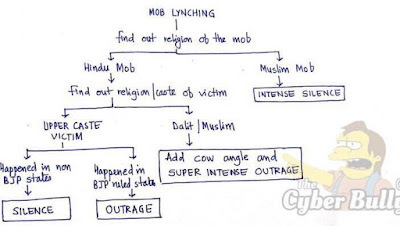 He reduced a mob lynching to a case of two groups fighting each other! This is why Modi is considered a dog-whistling weasel. Since then, there have only been more such cases, and they have garnered (unfavourable) international attention. In response, we have a peaceful, home-grown protest movement called "Not In My Name". It shows that not all of India has fallen prey to this "mad cow disease". Yet even this peaceful protest seems to have outraged some people. The chart in the image above is India's equivalent of "All Lives Matter". And it's mainly Hindus who take this position that the whole issue is being overblown, and everything is hunky-dory. Well, they may think they are correcting an imbalance, but to the rest of the world, they come across as entitled, privilege-blind people.